At the start of the 19th century printing was carried out in many small, independent and basic workshops that had often changed very little in 300 years. By the end of the period however a few larger firms operating in specially built factories dominated the printing industry. All processes were mechanised in these larger firms; traditional methods were being rejected in favour of new machinery. 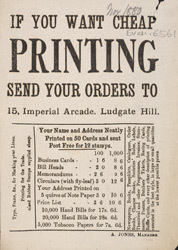 The company advertising on this leaflet is promoting their range of printed materials, from tobacco wrappers and hand bills (leaflets), to business cards and bill heads (letter heads).